Anyone who’s ever been to a Nats game with me knows that I have a thing for the National Anthem. I’ve been known to sing along, even audition to use my undergrad degree in Vocal Performance, and I’ve got pretty exacting standards for what it takes. Usually, I’m an anthem purist, but Glenn Donnellan from the National Symphony moved me with his Saturday performance. 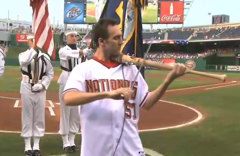 Donnellan, a violinist, constructed an electric violin out of a baseball bat and brought that out to Nats Park on Saturday and absolutely nailed the National Anthem. Usually I don’t go in for flourishes and extra ornaments, as they tend to be out of character for what is nominally a drinking song set to a poem about war. But Donnellan’s electric performance defies all rules about character and elevates it to something that even Sam the Eagle would find touching. Bravo, Glenn, and Bravo to the Nationals for hosting him. This entry was posted in: Music, Sports Fix, The Daily Feed, WTF? !